Nalini pointed to this review today, there are many quotes from the book; but the review is not spoilery at all. Ayaba, thank you very much! 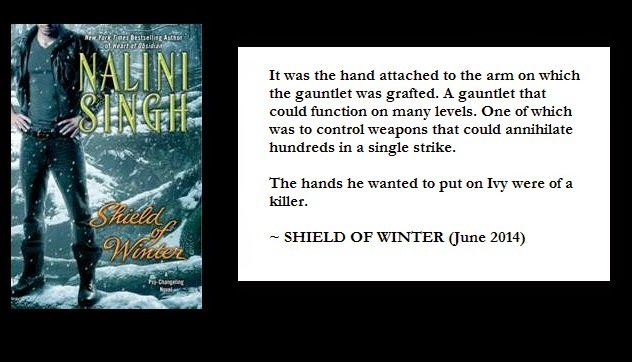 For folks who want to know Vasic's last name, who he is related to, and more spoilers, visit Amazon's Shield of Winter page and click on the "Look Inside" feature on the book image. If you are not signed into your Amazon account, you won't get all of the viewable pages. The "Look Inside" surprised me by having way more than what I had expected. I've never seen so many pages of a book available this way; usually you only get a snippit. Keep in mind that the vast majority of pages -- including huge chunks -- are deliberately omitted, as they should be. Still, the many dozen pages that are available will answer the questions re Vasic's family. I tried to hold back but I read all the available pages. I can't wait for Monday night when Amazon downloads the Kindle version. I was a little disappointed in the relative. I was surprised, will be disapointed only if Nalini does not explain the how in the book. So will wait till i read the book. Does anyone recognize his last name? Have we heard it before? There's more than one? We have met the one in the amazon spoiler. New quote! According to Nalini, this quote features two of our favourite Arrows. "You can't protect my sanity by destroying yours." His partner had already done far more than anyone could've ever expected in managing to keep Vasic alive this long. "It's not necessary any longer." For completeness, I'm posting the quote from yesterday's Nalini's blog. The child isn't psychologically suited either to the squad's training methods or to its mandate. Normally, I'd recommend he be removed from the program, but as the usefulness of his ability makes that a nonviable option, I suggest the immediate and repeated application of physical pain interspersed with psychological punishment to break him down. Only then can he be molded into an Arrow. And that's probably one of the most cruel official (as in government-approved) pronouncements about any of the Psy characters we have ever encountered.